Kirby Larson interviewed me! Yay! Oh, how I love Kirby Larson. I first got to know her through her writing, and afterward, as the generous and thoughtful human being she is. If you haven't read HATTIE BIG SKY, her Newbery honor novel, or TWO BOBBIES, or NUBS--nonfiction picture books that will lodge themselves in your heart--then you have some marvelous treats ahead. If you have, well, you know what a terrific writer Kirby is. Martha Brockenbrough is the author of the forthcoming picture book The Dinosaur Tooth Fairy. 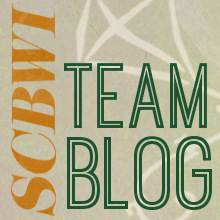 She is on the SCBWI National blog team, and is the social media director for readergirlz.org. She lives with her husband, their two daughters, and their smelly dog in Seattle. MB: I love working with an agent. I’ve worked with several. I’m sort of like Elizabeth Taylor and husbands, but that’s another story. - if you’re lucky enough to get an offer, they can and will make it better for you. There is no one path to success in this industry, though. And often, it’s not as cut-and-dried as you might imagine. The story of The Dinosaur Tooth Fairy is a great example of that. I never would’ve dreamed of submitting to Arthur Levine. He is ARTHUR LEVINE. I am merely myself, and at that point in my career, I wasn’t allowing myself such big dreams. Honestly, until he asked, it had never occurred to me as something I might do. I’d read plenty of Arthur Levine books, and after that, I read everything in his line that I could possibly get my hands on (and I have a long shelf of Arthur A. Levine books to inspire me). There was that little matter of having a suitable manuscript, though. And by little, I mean big. I saw Arthur a few months later at the SCBWI national conference in Los Angeles, and to my astonishment, he remembered me. He also spoke that year about picture books, and how we should not fear for their future. I was so heartened by the talk that I sent him a thank you note with something I intended as a throwaway joke. But Arthur saw a story in it, and wrote back telling me as much. At that same conference, I’d been impressed by an agent I heard speak. I set about finishing the novel I’d been working on, as well as working on that story idea for Arthur. I hoped to query the agent on one or the other when I was ready, assuming I was able to work out a deal with the agent who represents my adult work. That became an opportunity to query him. And while it sounds on one hand like outrageous luck, it was also luck born of work. I didn’t write a story meant to catch anyone’s eye. I just wrote it because it was my freelance job, and I wanted to do something above and beyond the normal. The moral? Do your work as well as you can. Focus on that. The rest takes care of itself. So, the agent said he’d be willing to work with me, even though he didn’t like the draft of the picture book I’d written. He didn’t sign me, but I revised it another twenty or so times (he saw two of those revisions). Then he finally read one he deemed “superb.” This, he sent to Arthur. A few months later (after some gentlemanly prodding from my agent), we heard back. Arthur liked it, but didn’t love it… yet. It didn’t have quite the emotional punch he wanted. So I revised yet again (I wrote sixty drafts, in all). The revision that worked, I banged out at SeaTac airport while I was waiting for a flight to Tahiti. This sounds great until you know that I was headed there to pick up my critically injured father and arrange for a Medevac flight home, provided he was still alive when I got there. Side note: If you want a really good way to keep your mind from wondering whether you’d ever see your dad alive again, try revising a picture book! You might just find sources of emotion inside you that you didn’t know you had. Another side note: I can’t really recommend this technique. Shortly after I returned home from Tahiti with my dad (yay! ), I lost my job writing those funny entertainment things that had earned me an agent (boo). But a few weeks after that, I heard from Arthur. He loved the book and was taking it to acquisition. I still didn’t believe it, though, until I saw Arthur in September at an SCBWI event put on by the Los Angeles chapter—where I also met the person who would become my new agent after the other one turned his focus to packaged books (yay/boo). I’ll stop now. If you’re still reading, I salute you. And will conclude by saying this: You never know what life will bring—the regular life, or the writing life. So, write your heart out. Share your talents. Get out there and meet people, being genuinely interested in what they have to say, what they can teach you, and what you have to give. Show your gratitude. Be courageous when things don’t go your way. Keep working until you can’t get better. Then get better anyway. Success isn’t guaranteed by an agent, and there will never be a moment when you are one, because life has a way of turning on itself. It will also turn you upside down from time to time. It’s the relationships that are important—the ones you have with people, and the ones you have with your keyboard. Give these everything you have, and you’ll have a meaningful ride on this earth, which is all anyone of us can really hope for.